The Homolgated Factory Evo 11 Systems of the LeoVince SBK range use TIG-welded stainless steel AISI 304 for the header pipes. The silencer with carbon fibre end-cap, is completely made of titanium with a choice of carbon or titanium skinning. The attachment brackets are made of carbon and most are available in Race Competition format. 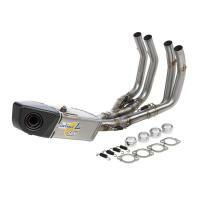 Also in this section are the seperate Headers, Decat Pipes and the Oval Evo 11 Systems.